A special thank you to 2018 IWF Grant Partner St. Mark Youth Enrichment for writing this guest blog. Learn more about St. Mark Youth Enrichment and other programs that received IWF grants in 2018 by clicking here. 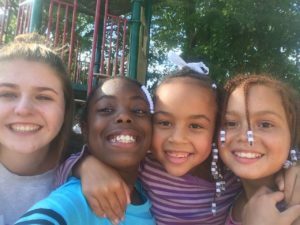 St. Mark Youth Enrichment is a nonprofit organization that offers quality, out-of-school learning programs before/after school and in the summer, serving 550 at-risk students, grades K-5, both in Dubuque and Western Dubuque communities. Like many communities in Iowa, Dubuque has a critical need for child care options. St. Mark addresses this need with affordable, safe, and engaging programs that foster a love for learning and support educational and social-emotional growth. The Iowa Women’s Foundation supports the crucial implementation of social emotional strategies that result in girls and mothers gaining social-emotional skills, as well as increasing access to the tools and resources to sustain their learning at home. St. Mark invests in training staff in best practice social-emotional curricula and philosophies because when students feel safe and connected, they are willing and able to learn. One curriculum is Conscious Discipline that teaches adults composure and how to interpret behavior communication while also building skills like self-regulation and conflict resolution within students through tools that emphasize safety and connection. Single and working mothers are supported through ongoing mentoring with St. Mark staff to work through behavior plans that set the child up for success in program, school, and home. This October, a family engagement event will provide tool kits and hands-on lessons for these moms to hone skills in composure.